No burger should go without fries. Unfortunately, making fries at home is a mildly infuriating process, because each cooking method has serious flaws. Frying them on a stovetop can produce excellent results but uses a lot of precious oil. Reducing the oil produces uneven results and dried out potatoes. Baking them in the oven generally results in either soggy or crispy-beyond-belief potatoes. I set out to find a better oven fries recipe to save on oil costs as well as the messy, tedious work of frying potatoes in batches. I found one through Cook’s Illustrated that works well, and with a few modifications, is also Paleo-friendly. 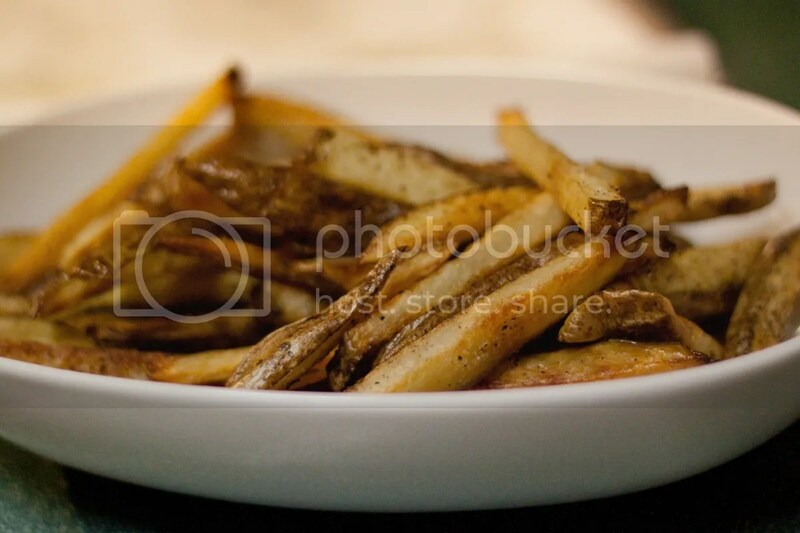 This recipe is unique in that you cover the fries with tinfoil for the first few minutes to steam them. 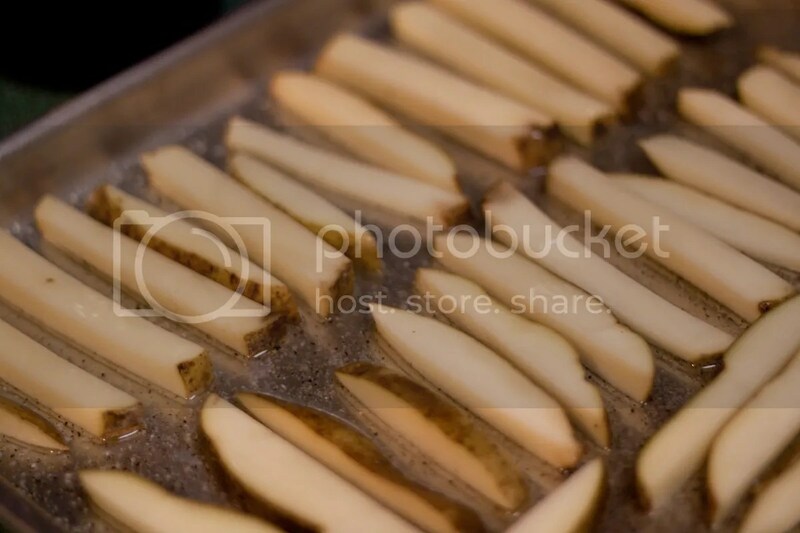 Also, you add salt and pepper to the pan BEFORE adding the potatoes, which actually works to keep the fries from sticking to the pan as well as evenly coating them. 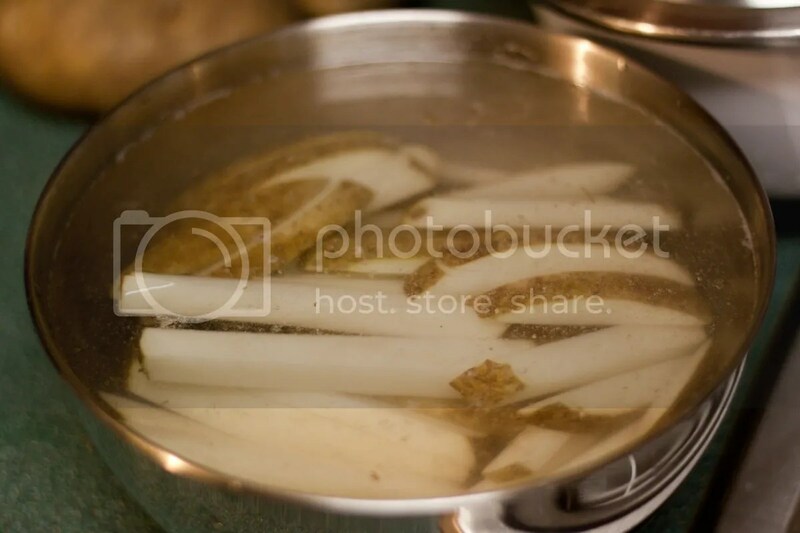 Place the potatoes in a bowl of hot water for 10 minutes. In the meantime, preheat your oven for 475 degrees and move your backing rack to the very bottom rack. Pour 4 tsp of oil on a heavy duty baking pan (promotes more even browning) and add the salt and pepper, swishing it all around to evenly displace everything. After 10 minutes, drain the potatoes and pat them dry, then toss them with the remaining 1 tsp of oil. Add the potatoes in a single layer onto the pan. Cover with tinfoil and add to the oven on its lowest rack, steaming for 5 minutes. Remove the tinfoil and continue to cook for another 15 minutes, rotating the pan after 10 minutes. Remove the pan and flip the potatoes with a spatula, keeping a single layer. Return the pan and continue to cook for another 15-20 minutes until they are visibly brown, rotating the pan at the 10-minute mark again. Lastly, remove the pan and place the potatoes on paper towels for a few minutes. That’s it! 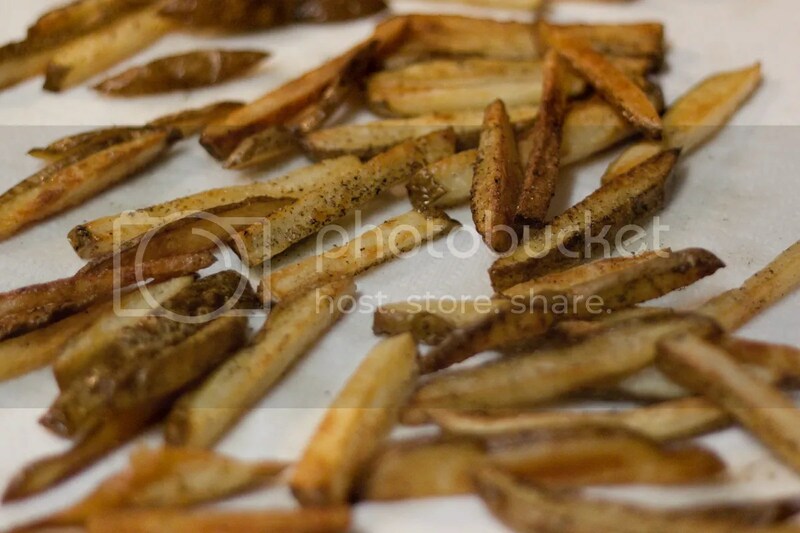 If you want consistent fries, make sure you cut them into similarly-sized pieces. Personally, I like the variety that comes with different pieces and their levels of crispiness, and I’m lazy, so I just cut them as I please. I’ve had mixed success with fries in the past so can relate to the infuriating part. Can’t wait to try these. Sweet! Thanks for the tips. How about sweet potatoes? Will they work the same way? We will see tonight! I have a crock-pot full of chili for some chili-cheese fries later! mmmmmmmm…. Hi Devon, I’m not sure if you need to make any adjustments to the recipe for sweet potato. They’re generally “mushier” than russet potatoes so they may get softer faster. Please let me know how it works out! I can’t wait to try these…thanks! Had to tinker with your recipe…. Took 3 potatoes peeled and sliced them to look like chips. Soaked them in ice cold (including two ice cubes) water for 30 minutes. Dried them on paper towels. Lined a baking tray with baking paper, Put the oil,salt and pepper on it and mixed in the potatoes. Covered and baked in oven for 10 minutes as my oven was on a lower setting before and I didn’t want to wait too long. Teens were clamoring for them. Tasted 3 pieces. My first potato chips since going primal/paleo/low carb. Don’t worry my two boys finished the rest. Fixed these for dinner tonight and my husband loved them!!! Carol, happy to hear that your husband liked them!